The Music & Dance group has its base in Naoussa, Paros. Lets see the history of our place. In the centre of the Cycladic complex of islands, lies the island of Paros. Its six villages and two small country towns – Paroikia and Naoussa -, are inhabited by approximately 15.000 people.The history of Paros Island started as far back as the Stone Age, although very little is known before the 2 nd millennia BC, when the Minoans settled on the island. 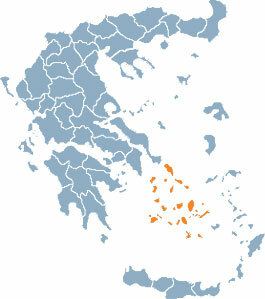 The name Paros comes from Parios, the son of Parassios of Arcadia, who colonized the island in the 1 st millennium BC. Paros was the birthplace of many enlightened scholars, such as the great poet Archilochos – who during his lifetime, was considered to be as important as Homer – and the famous sculptors Scopas and Agoracritos, who carved wonderful works of art from the renowned Parian marble. During the Byzantine Era, splendid monasteries and churches were erected on Paros, including the impressive Church of Panagia Ekatontapyliani (Our Lady of a Hundred Gates), the jewel of the island. Later, Paros was overrun by pirates and many people left the island to seek their fortunes elsewhere. Venetian Rule had a significant effect on Paros, as can be seen from the Venetian Castles and buildings scattered throughout the villages. After the Greek Revolution in 1821, Paros was incorporated into the New Greek Republic. Today, Paros is an extremely popular holiday destination for vacationers from Greece and abroad. 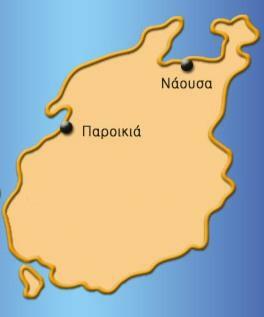 There are about 4.000 permanent residents in Naoussa, which is situated in the northern part of the island. This old country town has its own bay sharing its name. Naoussa was built in the 12th century A.D and was once surrounded by a fort, which served to be both the commercial and financial centre of the whole island for many years. This picturesque place, draws many tourists every year to its white-washed traditional buildings, narrow paved paths, its Venetian castle, old beautiful churches and sandy beaches all surrounded by the blue Aegean sea, On the 23rd of August every year a custom is revived. It is a unique representation of the secure of the island by the notorious pirate Barbarossa.